In the USA large appliances like clothes dryers or electric car chargers are built for 240V. 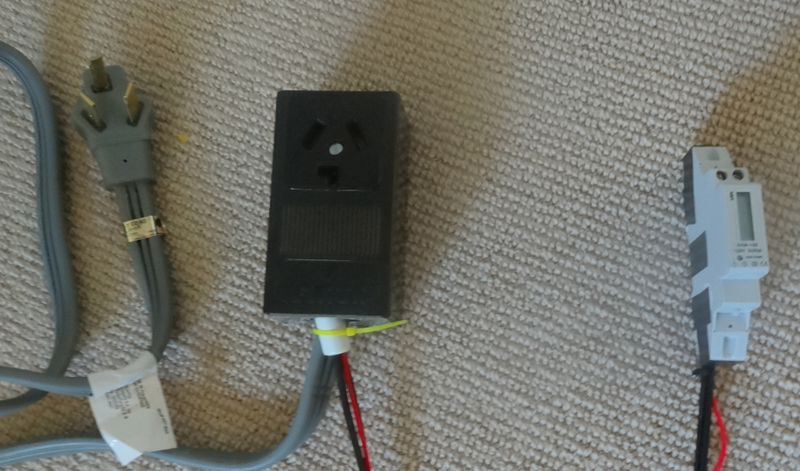 I happily have used the Kill-A-Watt EZ for simple measurements, but 240V appliances can’t be measured through it. The TED5000 I have measure whole-house electricity usage, but I wanted to update my chart of where power goes in my house (electric power, that is). I want to get an updated picture of what % goes to heating, fridges, etc. The TED5000 could be a great option but having to install a new MTU and CTs seemed complex, especially once it comes to aggregating the data into only one gateway. I thought splitting the 240V lines and feeding one live/neutral pair in a Kill-A-Watt… but not knowing more about the internals of the Kill-A-Watt I felt I may introduce unnecessary safety risks. With these elements in hands I assembled a simple 240V “extension cord” that has a remote display to measure the power going through it. The remoteness of the display (a design idea from the Belkin Conserve meter that is otherwise useless) is useful especially with 240V appliances where the outlets are inaccessible, behind heavy stuff, plugs are huge and hard to maneuver in cramped conditions, and you generally don’t want to be messing around with them. The assembly was simple. I got lucky since the CT of the EKM device fit nicely in the surface mount box with no stress to case or cable. Since it measures current going only through one live lead, the actual power is twice the displayed value in the meter. Unlike many other countries where the use of 2 out of 3 phases at 120deg phase is common, in the USA higher-voltage appliances are powered with two counter-phase live lines of 120V each, so getting the real power used is a simple matter of multiplying by 2 instead of by square root of 3. 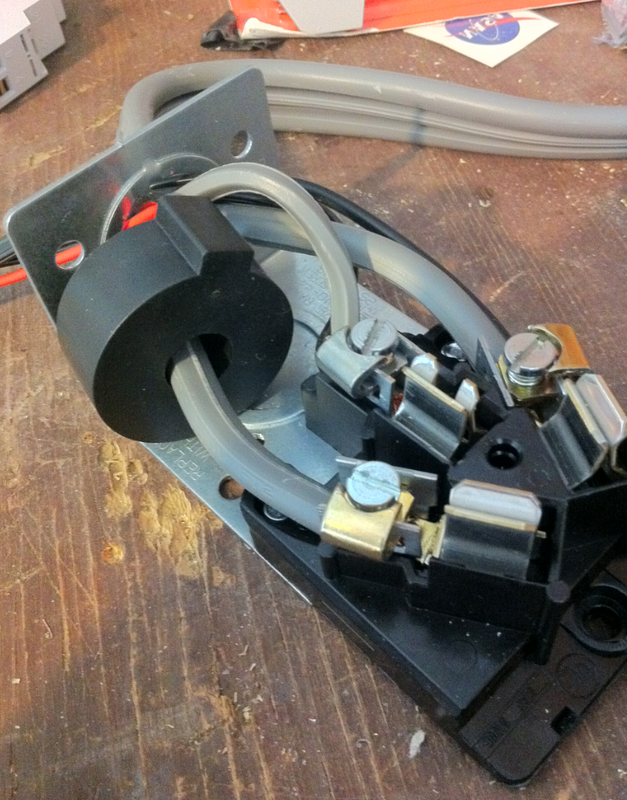 This meter is handling 240V with high currents so it is important to do a careful job if you decide to build your own. Doing 240 V in Canada is illegal if you are not an electrician and you can void your house insurance. You can hurt your loved ones, yourself, or your property if you don’t know what you are doing (this is true for everything in life, however). The EKM meter gets the current reading from the ring ammeter in the outlet, and reads the voltage through a couple of extra cables. The meter reads cumulative kWh so you need to keep a logbook of when you started and stopped measuring what. It tracks kWh to 2 decimal places so it’s more than precise enough for the use we are giving it. Portable vs Breaker Panel metering? I like the meter I built, for its portability, simplicity, and that I can lend it to friends. But after getting some basic measurements I am considering installing the EKM as an add-on to my breaker panel. This will allow me to periodically re-wire the CT onto different circuits. I may decide to invest in a better meter – EKM has a very compelling product line– , but I have pushed my electricity consumption so low already that I would need to expect to discover significant in the data obtained in order to recover the cost. After all, the basics save most of the money. But if you are starting the process I went through improving your house’s electricity efficiency from the beginning, or you want to discriminate between appliances such as electric cars, and you care about measuring stuff, I would highly recommend installing one of EKM’s smarter meters near the breaker box and investing in a couple of clamp-on CTs. If you don’t care about fine-grained measurement just follow the main improvements and use your bill to track improvement. Feel free to leave comments & questions below! This entry was posted on Sunday, July 22nd, 2012 at 16:49	and tagged with 240V, AC, Appliance, DIY, Dryer, Efficiency, Kill A Watt, Measuring and posted in Electricity, Measure. You can follow any responses to this entry through the RSS 2.0 feed.